In June 2010 it was reported that the Indiana University Art Museum (IUAM) contained material that had been derived from Edoardo Almagià. Earlier this month Chasing Aphrodite published images of the two pieces reported to be derived from this source. Both pieces, a South Italian black-glossed stemless cup and an Apulian trozella, were acquired in 1986 (inv. UI 86-48-1, -2). The IU Art Museum’s mission is to preserve, exhibit, collect, research, publish, and interpret original works of art to advance the academic goals of Indiana University and to enrich the cultural lives and spiritual well-being of society. Such a statement would suggest that there would be a desire to publish the full collecting histories of both the pieces. Retention of such information would presumably go against the academic goals of Indiana University (and indeed any university museum). The IUAM's director is a member of the Association of Art Museum Directors (AAMD). The AAMD guidelines on antiquities do not allow a passive response when the museum's attention is drawn to concerns. The AAMD would expect the museum to contact the Italian authorities to resolve the issue. Has IUAM contacted the Italian authorities? Will IUAM publish the full collecting histories? 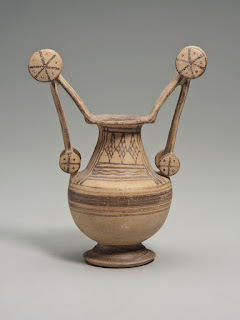 I note that 1986 was the year that the J. Paul Getty Museum acquired an Attic cup from Almagià.